The lobby lounge. Photo courtesy of Ritz-Carlton, Kyoto. 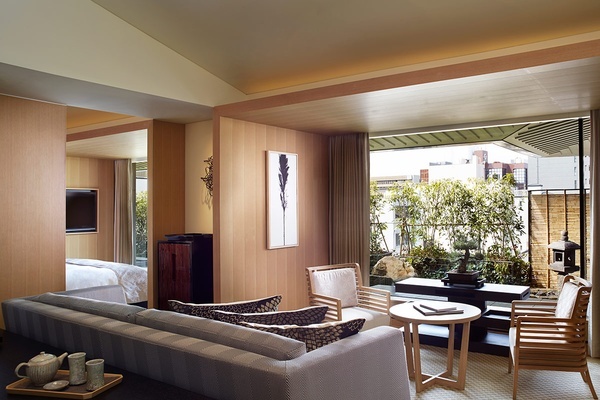 Popupla editor Berit Baugher checks into a contemporary retreat in the heart of Kyoto. Set on the banks of the Kamogawa River, a prime location preferred by Japanese noblemen since the 17th century, is a grand hotel that embraces the age-old Japanese traditions of refinement and elegance. 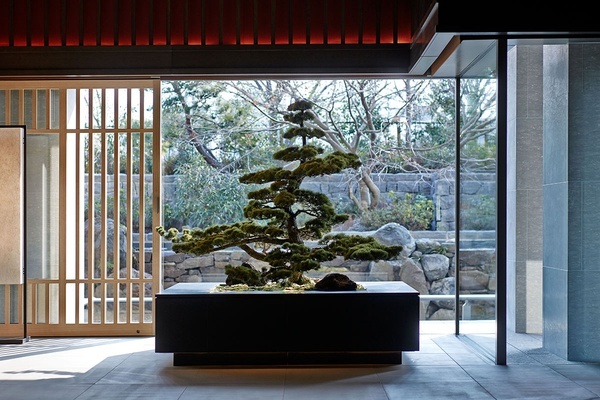 A bonsai tree in the lobby. 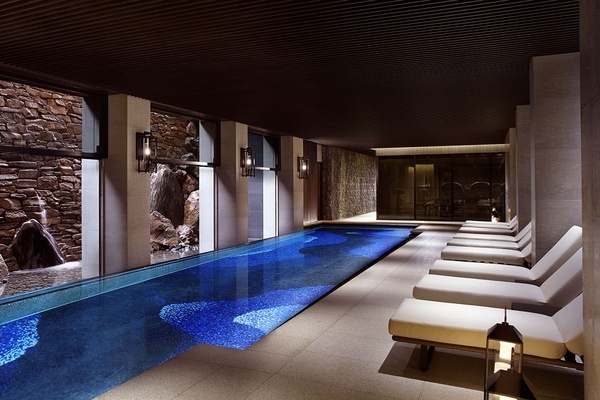 Photo courtesy of The Ritz-Carlton, Kyoto. The 20-meter swimming pool. Photo courtesy of The Ritz-Carlton, Kyoto. Japan can be a tricky country to navigate, so a top-notch concierge means everything to a foreign traveler like myself. After booking my stay, I reached out with a seemingly impossible request. I desperately wanted to visit , the city's famous moss temple and one of the hardest reservations in town. I was having a difficult time making a reservation from the US and my visit coincided with Golden Week, a cluster of Japanese national holidays when many locals travel within the country. Securing a reservation for Saihō-ji feels a bit like a game. First you write a letter to the temple requesting a visit and include three available dates. Within your letter you must include a self-addressed postcard to a Japanese address with a Japanese stamp. Then you wait to find out if you've made the limited visitors list for one of your preferred dates. Not an easy task for someone without access to Japanese stamps or a Japanese address. But the concierge made it happen. Upon my arrival at the hotel, I was whisked through a beautiful stone pathway flanked on either side by two tranquil waterfalls. Once inside, I was served a special blend of sencha green tea (made by , the three-century-old tea parlor around the corner), and presented with an envelope containing a ticket for two to visit Saihō-ji. Given my response, you would have thought I won the lottery. I was beyond shocked that they managed to pull it off and it turned out to be the highlight of my visit. If you can, I highly recommend adding it to your agenda. On my last day, I took advantage of the hotel's , one of the many fantastic activities available to guests. I would suggest doing this on your first day. It's a nice way to get the lay of the land and see top sites like the , , and . Other activities worth checking out include a sake tasting, sushi master class, and personal Zen garden workshop. Mizuki Tempura. Photo courtesy of The Ritz-Carlton, Kyoto. Garden Suite Living Room. 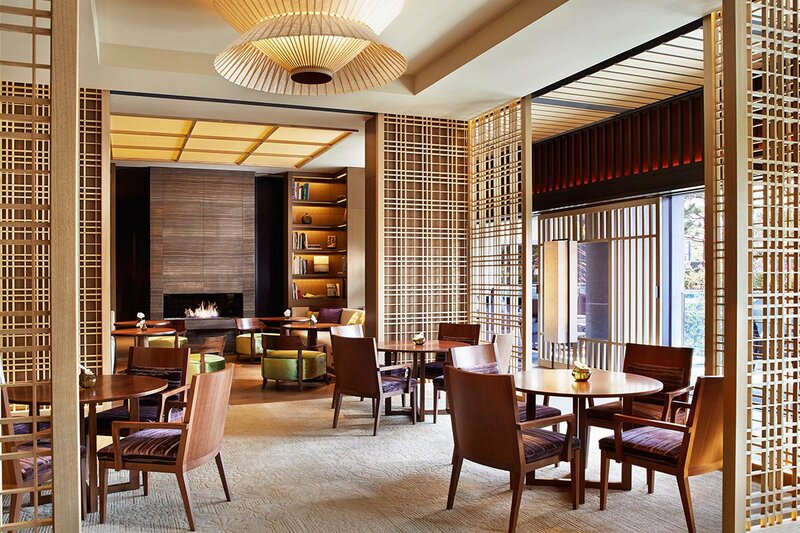 Photo courtey of The Ritz-Carlton, Kyoto. While I highly recommend exploring the city's exciting food scene, it's nice to have options within the hotel that feel authentic. 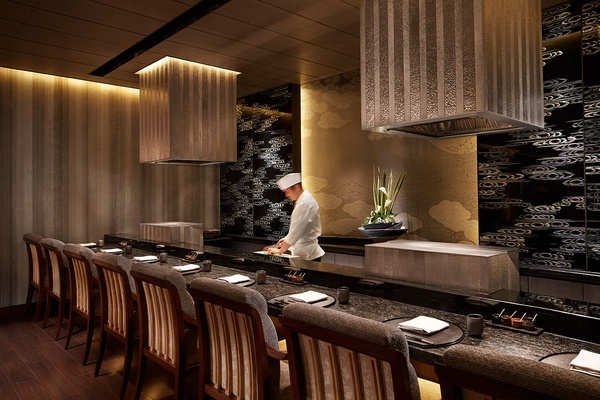 , the in-house Japanese restaurant, showcases four traditional cuisines (kaiseki haute cuisine, sushi, tempura, and teppanyaki) in various settings. I spent a wonderful evening at the tempura bar with Chef Kenji Fujimoto, where I watched from my seat as he prepared tasty morsels in delicate layers of batter. The tempura was lighter than any I'd tasted before and the performance aspect of the meal made it very memorable. For those wanting a Western-style dinner, serves fine Italian cooking with a contemporary twist. has a small boutique in the lobby that sells cakes, macarons, chocolates, and other delightful French treats. My favorite way to unwind after a long day out was in the lobby lounge with a matcha tea latte and one of their fresh pastries. The croissants, served at breakfast, are not to be missed. The 134 guest rooms — including seventeen suites and two traditional Japanese-style tatami rooms — pay homage to the traditions of Japan with patterned motifs created by local artisans, Yukata bathrobes, and bathroom tiles inspired by the country's famed cherry blossom. A neutral color palette (white and cream linens, a mix of light and dark woods) and minimal decorative accents (bonsai plants and calligraphy artwork) create a soothing and airy environment. bath salts and a stunning ceramic tea set are just two of many thoughtful in-room amenities that are created by local businesses. There is so much to see and do in Kyoto, that one could have an entirely different visit every time. The city is home to thousands of temples and shrines, each more beautiful than the next. With over 1,600 to choose from, the task can feel daunting. Pick a few that feel special and base your agenda off that. 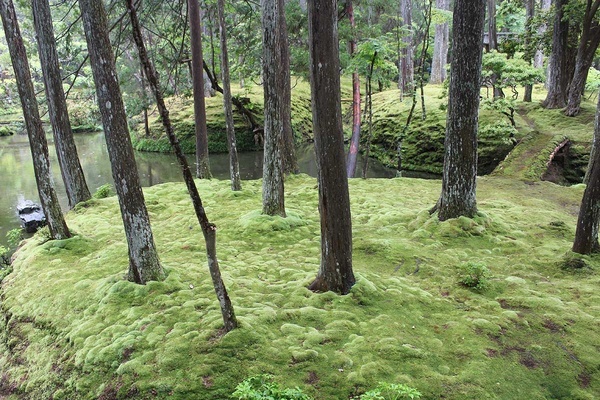 Saihō-ji, which I mentioned earlier, was my favorite of the bunch for its beautiful moss garden. is a Shinto shrine that sits at the base of a mountain. Go early and you can spend your morning hiking through the seemingly unending path of over 5,000 orange torii gates. Sanjūsangen-dō is a Budhist temple famous for its 1,001 statues of Kannon and lovely outdoor garden. is best-known for nearby . Nishiji Market is great for picking up gifts — beautifully packaged Japanese cookies and candies, traditional Japanese knifes — as well as tasting local delicacies like grilled squid and dashimaki tamago (Kyoto-style rolled omelette). For a heartier lunch, head down the street to . The curry tan tan noodles are out of this world. 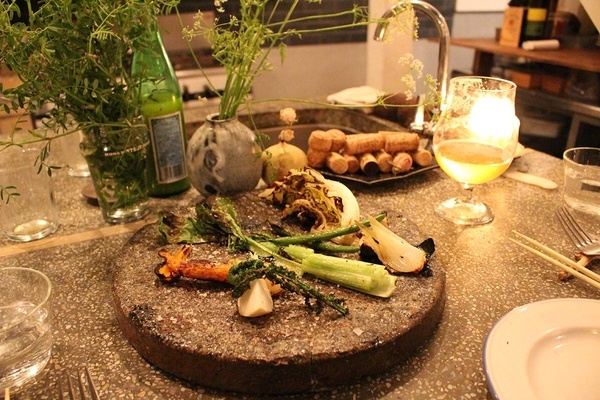 , a Nordic-meets-California-cuisine restaurant that I learned about on Snapchat (of all places) was, "off the beaten-path" — literally. The fourteen-seat restaurant is just under six months old and located along the dirt-lined , a favorite spot for cherry-blossom viewing. Reservations are a must. Yoshihiro Imai, the sweet and soft-spoken owner and chef, forages nearby farms and local markets for ingredients each morning to create artful four- and seven-course dinners. Every dish I tried was delicious. Highlights included a frothy onion soup topped with parmesan and a beautiful vegetable plate made with roasted carrots, turnips, bok choy, cabbage, onion, and green beans sprinkled with flaky sea salt. Request seats at the bar so you can watch him in action. For a truly special souvenir, I visited . The family-run shop has been crafting beautiful brass, tin, and copper cylinder tea caddies for nearly 150 years. 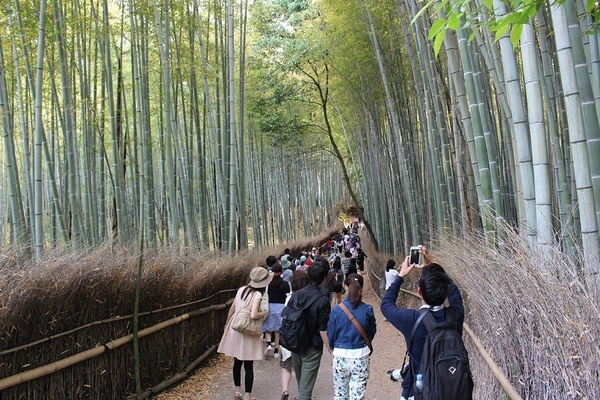 Arashiyama Bamboo Forest. Photo by Berit Baugher. Despite it's name, Osaka-Itami International Airport (ITM) is the closest domestic airport and a 60-minute drive from the hotel on the airport limousine bus. Rooms start at ¥55,000 per night. .